Does Klout Measure Clout? The Problem With Social Influence (Part 1) - SmackSmog! Trying to gauge one’s success or ability to be active in the online social space has generated quite a bit of business. App’s that grade social influence has for some, become a means for helping identify success or ability in social media. 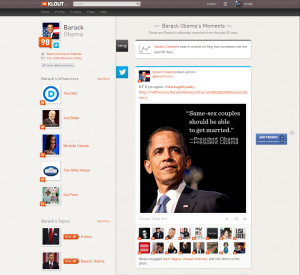 The most familiar one, Klout – “The Standard for Influence”, has created an algorithm that gauges your online chops. assigns a number to your activity, based on the mysterious algorithm, and voila: you’ve got your social influence! Or do you? I worked for an organization for eleven years, where the bulk of our time was in developing relationships. Of our myriad responsibilities, our mission rested on character and spiritual formation with college students. This is a very qualitative goal, and as an organization with both organizational and individual donors, offering benchmarks and success indicators was necessary -among other things- to bolster our income. It became an issue of controversy within the organization: “How can we turn our students into numbers? And what is “success”? Every student is different, does a one-size-fits-all measurement accurately reflect our efforts?”; and so on. You get the point: qualitative work doesn’t easily translate to quantitative measurements. The same problem in inherent in these platforms. They attempt to provide something with which people can measure their influence, or that or their organizations. (They measure accounts, but not by type; your can sign up your business or nonprofit for these platforms as well.) It can be helpful, yes? It gives us a place to consider our efforts, and to gauge them, and where to grow. They are also dangerous: if we only know a little about them, they can become reductionistic. That is, we become our number, or our social influence is reduced to an algorithm. Those outside of the familiarity of the technological rubric, then, determine success between 1-100, crafting a resume of sorts. Barack Obama, then, is doing real well at 98; as is Lady Gaga at 92, and Justin Bieber at 93. These 3 celebrities are in the top four for Twitter followers, although the number of “real” or active accounts is much lower than the number we see in their follower stats. But, have you ever had a conversation with any of them online? And if you look at their timelines and content, how often do they mention others? And at what follower diversity, and how often? Although the tenor of the content is quite relational, their ability to actually engage in conversation with their fans and followers is quite low. Understandably so. But for you and I, we don’t have millions of people to respond to, or even engage with. We’re lucky to have a couple of hundred in our circle of online relationships that we connect with, yes? Maybe more for our business. So if Barack Obama is not really engaging with millions, why is his number so high?